Tranquil and Spa –like this open, spacious home features walls of glass overlooking a sparkling pool and spa features amazing views. A 12 foot ceiling in the living room and walls of sliding glass doors open directly to the pool area.. Dining room comfortably seats eight, wireless internet. Media room with surround sound. Large luxurious master bedroom is designer perfect overlooking the inviting pool. Master bath has large walk-in shower separate soaking tub. Two guest bedrooms w/large comfortable rooms; queen sized beds..
Soothing sounds from fountains create a relaxing spa-like atmosphere throughout the home. State of the art gourmet kitchen. Outdoor dining overlooking city. Outdoor grilling station. Completely Gated property with off street parking for 3 cars. The perfect Los Angeles location. Perched atop of the famous Hollywood Hills. Only a five minute drive straight down the hill to the fantastic Sunset Strip. Where you will find the best restaurants, shopping, markets and nightlife that Los Angeles has to offer. And minutes from the heart of West Hollywood and Beverly Hills with Rodeo Drive shopping and unmatched fine dinning. For our Entertainment executives and celebrities, a five minute drive down the valley side of the hill places you at all the major studios -Universal, Warner Brothers and Disney. The estate comes completely outfitted with all the amenities and conveniences necessary for the discerning guest. Master bathroom is a luxury spa style bath with stand alone shower, over-sized tub and terrazzo-noche countertops. Guest bath is conveniently adjoining between the two guest rooms with two grooming stations including sinks and mirrors as well as a stand alone shower. Blow-dryers included in each bath. The estate comes completely outfitted with all the amenities and conveniences necessary for the discerning guest. Fully appointed gourmet kitchen, generous dinning and serving accessories Outdoor grilling station Media room with surround sound, DVD player, IPOD docking station Music system throughout the home w/ separate room controls DVR recording system for personal TV presets Flat screens in every room Al linens, towels, pool towels Pool can be heated at additional fee Home is not childproofed. I travel often and have rented many homes as I often am able to bring my family with me. This was a trip where I was able to bring my wife and 2 children. I could not have been more pleased with this place. It is in the Hollywood Hills which allowed for easy access to all my appointments and killer views....especially at night. The property was perfectly appointed and designed beautifully. And my kids loved the pool and Jacuzzi. We will be back. Soon. Thanks so much Steve - and we look forward to your next visit.. Staying at this house was like staying at a luxury hotel suite, but located in a GREAT location at the top of the Hollywood Hills! Very clean, perfectly appointed, very safe, amazing views, lots of light and open spaces, big kitchen, comfortable beds... .a great house! We felt like movie stars! We never thought we could live like this. This is what you see on TV, but it is even much better being in the real space. My family (wife and 2 kids) was able to come out with me (from NYC) on a business/pleasure trip. I've always stayed in hotels, but wanted something special this time because the family came along. First of all, the place is amazing- the proportions, layout and amenities, But it was also immaculate. The sunlight coming into the house was wonderful. And it was hard to get the kids out of the pool. It was exhilarating but also romantic for my wife and me. The internet was top speed, linens immaculate and it felt very private, especially being so close to the rest of town. Every question was answered for us. We figure this is what movie stars must feel like when they are being housed. We definitely want to return! Exquisite property, wonderful hosts, sublimely relaxing! Where to start? We had such a wonderful time at this incredible property. The pictures indeed do not do the house justice; it's even nicer and the communal areas (living room in particular) are huge and well appointed. The bedrooms are super comfortable and quiet - waking up there it was hard to believe the commotion of Los Angeles was going on about us. Michael and Claire did an outstanding job of welcoming us to the property (despite our late arrival on an international flight), giving us all the relevant information for the house and ensuring that our stay was going well throughout without being at all obtrusive. I can't recommend the property and hosts highly enough - it was without doubt the best property rental experience I've ever experienced. Thanks again - hope to return soon! Fantastic property, even better than advertised. We have high standards, and this not only lived up to our satisfaction, it exceeded, as the photos do not do the tranquility and incredible views that the home provides justice. We just completed an amazing 5 day stay @ the home, and by all accounts (2 adults and 2 teens), it was a wonderful place to stay. Michael and Clare were both very professional and responsive to our questions, as this was our first vrbo experience. The payment process was given to us in clear step by step directions, and within a couple days of staying at the property, the hold on our security deposit was promptly returned. When we arrived, Michael was waiting for us, and he walked us through the property and provided an instruction manual for all aspects of the home, including hvac controls, pool/hot tub options, entertainment system options and so on and so forth. 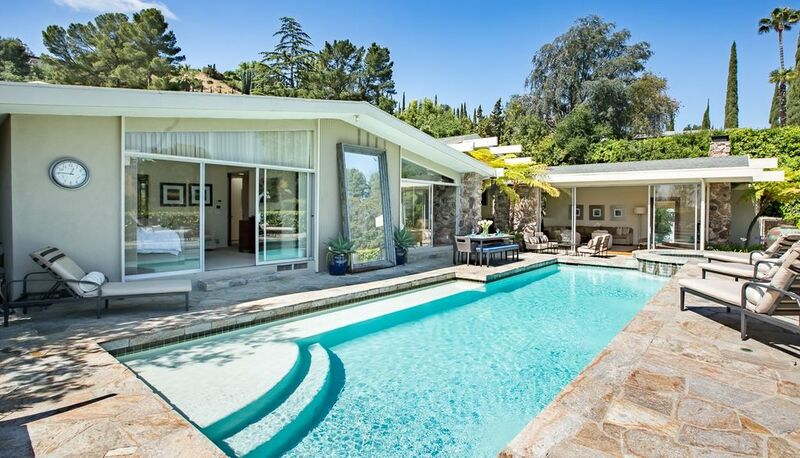 The views from the pool area are incredible, and you definitely get the feel that you are away from the congestion of L.A, as you are up in the Hills, amongst some of the finer real estate in the region. The bedrooms (3) are all well sized, and the Master has sliding doors that open to the pool area. There is a jack and jill bathroom between the other two bedrooms, with an additional powder room near the entry. The kitchen (top notch appliances) is well stocked as there are spices, pots/pans and dishware that allows for you to cook fabulous meals. The pool and hot tub can be heated and the outdoor furnishings work well and are in excellent condition. The property is gated, in a safe area and the property is beautifully landscaped and well appointed. Michael met us when we checked out, and he was prompt, which is important to us. We look forward to returning to the home on a future visit. You have a beautiful home and I want to thank you for giving us the opportunity to stay there. Very tastefully and elegantly decorated, too. We had a wonderful time and enjoyed every minute......much needed R&R!!! And I must tell you that even though the pictures are amazing... the house is even better and more fantastic then the photos! We are the couple from Edinburgh - and so forward to coming back. The perfect Los Angeles location. Perched high atop of the famous Hollywood Hills. Only a five minute drive straight down the hill to the fantastic Sunset Strip. Where you will find the best restaurants, shopping, markets and nightlife that Los Angeles has to offer. And minutes from the heart of West Hollywood and Beverly Hills with Rodeo Drive shopping and unmatched fine dinning. For our Entertainment executives and celebrities, a five minute drive down the valley side of the hill places you at all the major studios -Universal, Warner Brothers and Disney. If reservation is within a 60 day period payment will be due in full at time of booking. Cancellation terms: All payments made by you for bookings covering including dates in the months of May, June July and Aug: and Dec 15th - Jan 15th are non-refundable. All other dates fall under standard cancellation policy listed within the terms (re-iterated here as well) For any bookings covering dates not listed here: To cancel your booking, you must provide the Company with written notice of your cancellation. If the Company receives this notice at least 75 days prior to your arrival at the Property, the Company will retain 20% of your total rental fee. If the Company receives this notice less than 75 days prior to your arrival at the Property, all payments made by you are non-refundable. You are urged to obtain travel insurance for protection against, among other things, your inability to make the trip contemplated by this agreement.